This will be the 6th year of the race and the organizers finally have planned a perfectly designed stage race. Mark your Calendars, the dates of ATOC are May 15-22, 2011. This race is so much fun to attend and very easy to navigate. Racers are relaxed and extremely accessible, the weather is good, and there are numerous options for arrival and departure airports, rental cars, and hotels. California is my home state, so to me the Tour of California means a week of combining time with my family with fun days at the race host cities. 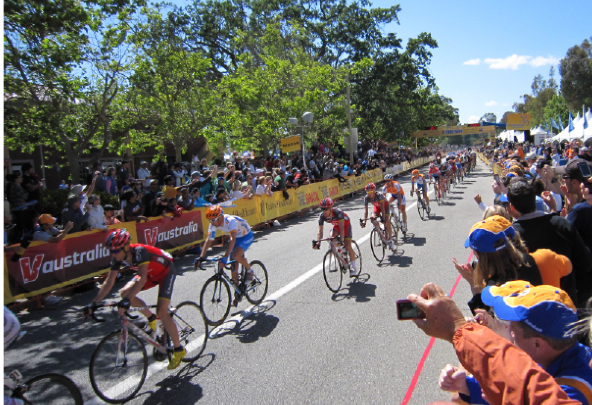 The state of California shines during the time of the Tour of California. I remain more excited about this race than any other, and I am a huge fan of the Giro d'Italia, the Tour de France, the Spring Classics, and of course the planned Quiznos Pro Challenge coming to Colorado this year (where I live), but to me - the year is all about the Tour of California! I will be happily attending Stage 5, 6, 7, and 8 in Southern California, simply because I am unable to make the drive west across Nevada one more time from Colorado. If you've never done that drive before, trust me, keep it that way - don't ever do it. Fly in a plane to Northern California! Last year I flew from Denver to Burbank Airport, walked less than a block out of the terminal to pick up my rental car, and enjoyed 4 great days in California.